Find hotel near Cape Roger Curtis Lightho ..
Cape Roger Curtis Lighthouse is a hidden gem on Bowen Island. It is recommended to head towards this area a little before the sunset to witness the spectacular views. Listening to the sound of waves crashing on the rocks is a soothing experience here. 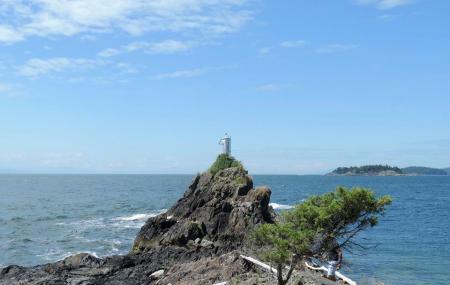 As the forest is close to the beach, you will also get to see different local birds while visiting this lighthouse. The surrounding area is yet to be developed as a tourist attraction. So, it is usually not crowded, making it a peaceful spot. A short ferry ride from vancouver but it feels like you’ve been transported somewhere entirely different. Cape Roger Curtis lighthouse is truly a beautiful view. Very rocky but a short hike to get to from the road. Stellar views of the ocean and parts of the mainland. Would highly recommend. Nice little cove... Not as secluded as it once was. Nothing stays the same forever though. Still a gorgeous place.